The world's largest country is divided into regions, territories, republics, and federal districts. RIR tries to explains how the complicated set-up functions. Russia's regional administrative division is complicated. There are regions, territories, republics, and federal districts. All these are formally equal under the constitution, but in reality there are considerable differences. Experts say this complex state administration system is a legacy of the Russian Empire and the Soviet Union. In the early 17th century, Peter the Great introduced the notion of “gubernias.” There were originally eight such entities, but their number grew over time as new territories got annexed to the Russian Empire. By the beginning of the 20th century, the system became more complex as the concepts of regions and subordinate territories emerged. Ethnicity-based regional division came to the forefront during Soviet times, giving rise to autonomous republics, autonomous regions, and autonomous districts. The first autonomous republics in the U.S.S.R. were converted from those gubernias in which Russians were not the predominant ethnicity; later on, some of the autonomous districts got renamed as autonomous republics. After the U.S.S.R.'s collapse, the Russian Soviet Federative Socialist Republic became known as the Russian Federation; its former autonomous districts were renamed as constituent entities, and the former autonomous republics adopted unique names to reflect their predominant ethnicities, such as Tatarstan. The current Russian administrative territorial division was formed in 1993, with the passing of the country's constitution. It was further modified as several federation subjects got merged in the second half of the 2000s (out of the original 10 autonomous districts, six ceased to exist in the process). There are 21 ethnic republics in Russia, alongside nine territories, 46 regions, two federal-level cities (Moscow and St. Petersburg), one autonomous region (the Jewish Autonomous Region), and four autonomous districts. The most ubiquitous administrative unit is the region. Regions are not ethnicity-based; the capital city of a region is the largest settlement within its bounds. A region is managed by the local administration, which is headed by the governor. Regions have their own parliaments, which perform local-level legislative functions, mostly for the purpose of localizing the federal laws. The fundamental law in each region is the charter. The Jewish Autonomous Region does not differ from the ordinary regions in anything but its historic name. A territory does not differ from a region in terms of administration, but its area is greater. Some of the territories are made up of several regions. An autonomous district is an ethnicity-based territorial entity, which forms a part of a greater Russian subject – a territory or a region – but enjoys special rights. Some of Russia's ethnic minorities live entirely within their respective autonomous districts. Republics, unlike territories and regions, are ethnicity-based states within the state. Their form of government is intrinsic to the ethnic minorities, which populate them. One example is Tatarstan, where most of the Russian Tatars live. Republics have their own constitutions, and are headed by their own presidents. A republic has the right to elevate its ethnic language to the official level on a par with Russian. "The Russian constituent entities are very different," said Vladimir Kagansky with the Institute of Geography of the Russian Academy of Sciences. "This diversity is quite difficult to manage, because you need a multitude of approaches and strategies. Contemporary Russia is an empire in terms of its structure. The country's focal point is Moscow, and the relations between the center and the periphery are pretty much polarized in the political, ethnic, and economic sense." Historic inertia is the only explanation for this complex system, said Pavel Kudyukin, a professor at the Higher School of Economics. "The current system reflects the structure of the Russian Empire and the Soviet Union after it." Kudyukin said that, according to the Russian constitution, all the constituent entities are equal. This, however, is not entirely true in practice. From the legislative standpoint, for example, the republics have their own constitutions, whereas the other constituent entities have charters. "Incidentally, regional constitutions sometimes contain paradoxical clauses," Kudyukin said. "Tatarstan's constitution used to have a clause saying that the republic was a subject of international law, in direct contradiction to the federal legislation." The latest trend, launched in Bashkortostan, has been to rename the titles of the republics' heads. Perhaps there will be no regional presidents left in the future. The year 2000 saw the introduction of a new entity: a federal district. Such districts unite several neighboring regions, territories, and republics. Introducing the federal district was one Vladimir Putin's first major decisions during his first presidential term. There are currently eight federal districts: Central, Volga, Northwest, Far Eastern, Urals, Southern, Siberian, and North Caucasus. The federal districts were introduced to improve communication between Moscow and the local governments. In the 1990s, the heads of regional offices of some federal agencies tended to grow excessively close to the local political elites, and would start lobbying for the regional interests rather than the federal ones, Kudyukin explained. Despite this multilayer administrative division, Russia's territorial integrity is quite safe. "The country resembles a set of nesting dolls," said Natalya Zubarevich, the director of the regional program at the Independent Institute for Social Policy. "This type of administrative division makes sure that Russia will not fall apart: the worst that can happen is it will shed individual territories with distinctly different cultures. 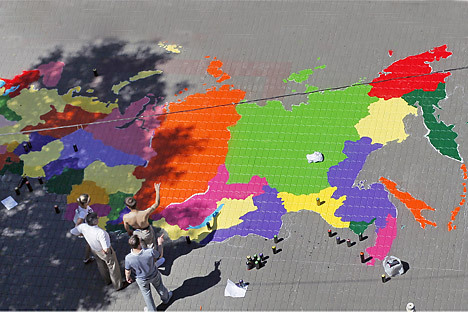 There are such secession-prone areas in Russia, but they are few."